Fine purveyor of pedals J Rockett Audio Designs has unveiled the latest in its Tour Series line, the Stevie Ray Vaughan-inspired Lenny Color Boost. 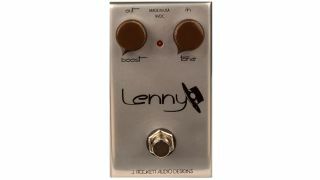 Intending to imitate a pushed Dumble Steel String Singer - once SRV's amp of choice - the Lenny will "colour your tone considerably, in an inspiring way" with a distinct mid character, according to J Rockett. Two controls handle boost and tone duties, while the pedal operates from a 9V power supply. Simples. The Lenny is available now for $179/£159 - you can hear it in action handling the titular tune above.